Learning how to draw perspective is one of those art techniques that gets kids to sit up and take notice. Part of the excitement is realizing that art has rules. Kids are aware of the basic meaning of perspective, but when you actually show them what the vanishing point is and how it relates to the size of objects, it’s truly an aha moment. 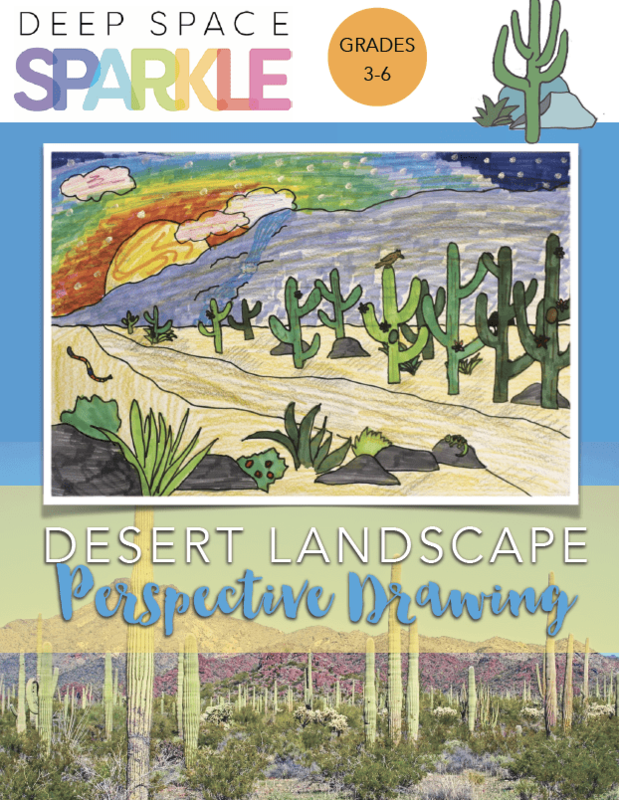 This 20-page PDF lesson plan includes a 14-minute VIDEO on how to draw this desert landscape with explanations on HORIZON LINE & VANISHING POINT. The video link can be found on page 2 of the PDF lesson. You will need to use the embedded password to view the video. The video details the drawing portion of the lesson with emphasis on drawing the one-point perspective. This video speaks directly to the student. You can play the video in your class. The video will offer instructions to pause and allow students to work on each stage of the drawing. This and many other bundles are included in The Members Club…FULL access for a low monthly fee. – Vibrant community of teachers to support and celebrate YOUR success. MEMBERSHIP ONLY OPENS TWICE A YEAR: Sign up for the WAITING LIST to learn when YOU can join The Members Club!